How do I Start Introducing My Baby to Solids? I remember sitting in my friend's kitchen. It was her little girl's party. The sun was shining. A lovely glow. A late summer evening. My baby was on my lap. I bent down to smell his soft downy hair and from out of nowhere, a little hand reached out and grabbed a piece of sticky pizza from the table that was laden with party goodies. The little hand deftly guided the pizza into a waiting little mouth. Triumphant! That was not the plan. That wasn't how I was going to introduce my baby to solid foods. But plans often go out of the window where kids are involved. 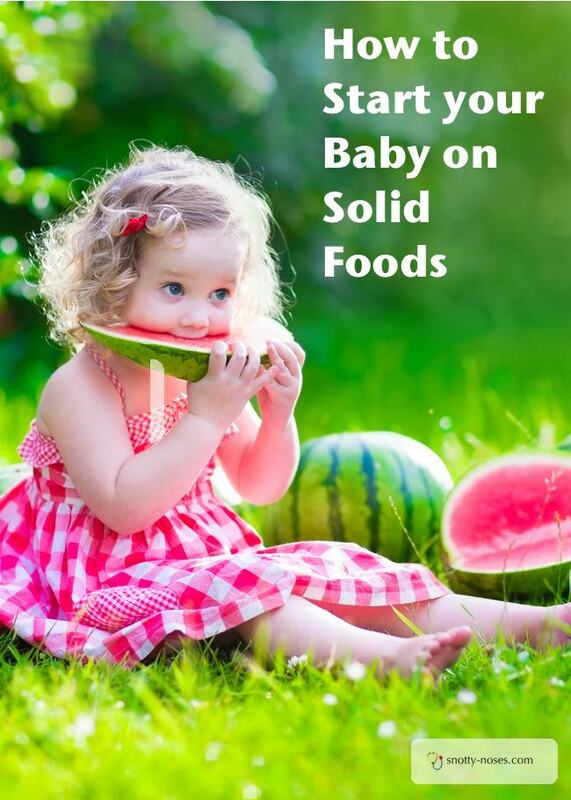 Starting your baby on solid food is such an exciting time. If this is your first time weaning your baby on to solids, it might be a bit baffling. What exactly are you supposed to do? Remember, to begin with, your baby is just getting used to this alien concept that is food. This is the first big new thing they’re going to learn since they were born. Food? What is that?? Don’t worry if they don’t eat much to begin with. They’re going to continue to get all their nutrients from milk, either breastmilk or bottle milk. Continue with your normal milk feeds and start introducing solids as an extra. 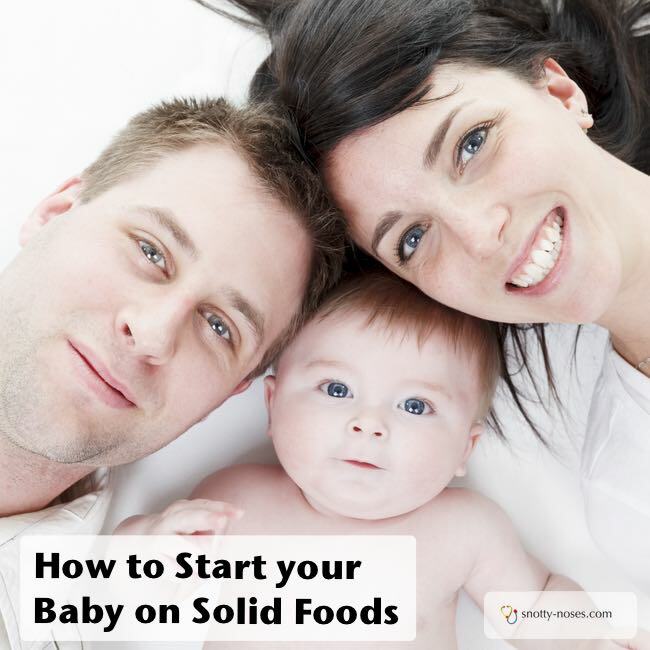 How do I Start Giving My Baby Solids? Choose a time of day when your baby is relaxed. You don’t want them to be starving and keen for a milk feed as they’ll probably end up getting cross that you are giving them something strange rather than milk. I used to give my babies an early morning milk feed and then start with a little bit of solid food for breakfast. You can do what works for your routine. Start with just once or perhaps twice a day. Let your baby explore the food. They don’t know what it is and will want to check it out. Start with a small amount, don’t overwhelm them. Don’t force them. If they aren’t interested, don’t worry. Baby Led Weaning is when the baby is given food and allowed to choose what they eat. Normally they are given lumps of food rather than puree which is the more traditional way. Baby Led Weaning ‘purists’ will say that NO spooning of puree is allow. That’s to say, if you ever give your baby puree from a spoon, then that isn’t baby led weaning. Advocates of baby led weaning claim that it leads to less fussy eating later in life and that children are more likely to eat healthy food. Is Baby Led Weaning better? There is no actual ‘proof’ that Baby Led Weaning is definitely better than traditional weaning. Some things can be really difficult to prove or test and I suspect that this is one of them. It’s a personal choice which way you decide to go. Just do what you think you’ll enjoy most and is best for your baby. This is my personal approach to introducing solids. Think of it as traditional weaning but quickly moving on to Finger Food. To start with puree and to quickly move to finger food along side puree. To always have home cooked food rather than food from jars. This may sound difficult but actually cooking up some vegetables is really quick and easy. This also means that you will rapidly get your babies eating along side the family as you won’t want to make different meals. It’s easy to adapt meals that they are suitable for your family and your baby. Whichever way you do is fine. If you go the puree way, make sure you do introduce finger food early on and don’t keep the puree smooth and runny for too long. Children need to be introduced to lumpy food so that they can get used to different textures. By the by, babies aren't supposed to have sugar or salt before the age on one. Party food isn't supposed to be on the menu! Grab your copy of the free guide to find out more.